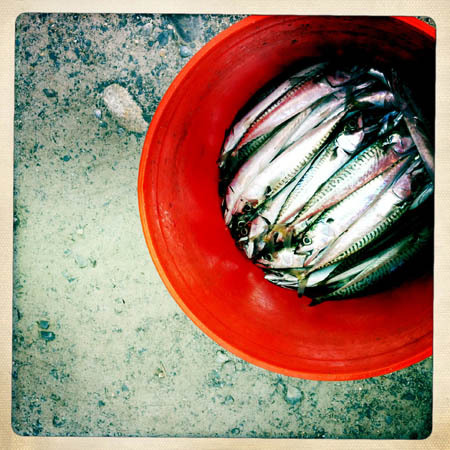 Surfland Bait and Tackle – Plum Island Fishing » October 21. Wish we were in New Jersey. October 21. Wish we were in New Jersey. Tom S. sent me this link today with the instructions, “Definitely don’t watch this video, and if you do, stop watching before the 26 second mark.” Wow. Shore Catch Guides in Manasquan, New Jersey. This week. For us, it’s still just Macs. So we grabbed a bunch for the shop. 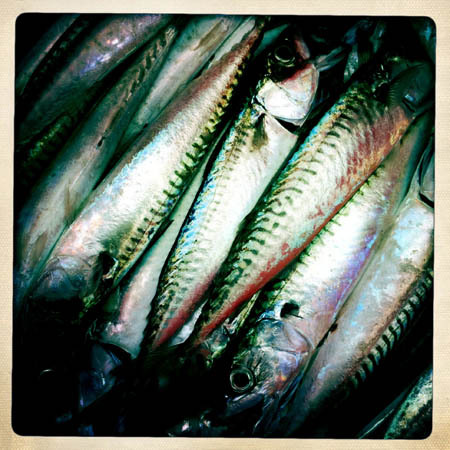 And our author tried to make some arty photos of a bucket of fish. When did these blitzing stripers pass by us?? My colleague has a family house in rural western Ireland that he visits regularly, where he buys fresh macs at the country market every Sat. …fries ’em up w/ butter; I’d think they’re too bony, but he swears by it! P. S. Maybe at least this is a sign of a healthy mac stock, and promising prospects for the species up the chain!! We ARE at the northern edge of the striper’s migration, most likely these “blitzing fish” never even made it up this far. We do get big bass up here, but the huge schools of 40lb fish and up stay south and offshore for the most part. Its not like every striper on the east coast passes by plum island. Its like this a lot of the years, the striper fishing down there IS better during the migration.